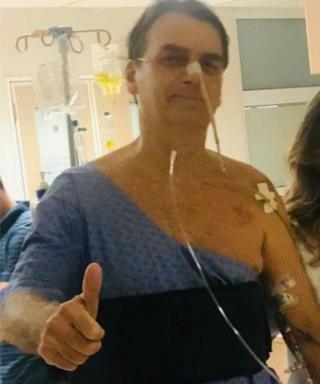 Mr Bolsonaro has been in hospital since an operation last week to remove a colostomy bag fitted after he was stabbed while campaigning last year. Presidential spokesman Otávio do Rêgo Barros said it was not clear if the pneumonia would prolong the president's stay in hospital. Mr Bolsonaro tweeted a video of his spokesman's statement, adding jovially: "Beware of the sensationalism. We are very relaxed and we remain strong." Mr Bolsonaro had been due to be discharged by next Monday at the earliest. He is continuing to perform breathing and muscle-strengthening exercises, doctors said. Mr Barros said the president was still on a liquid diet and was looking forward to steak and chips when it was over. The 63-year-old president was checked into hospital on 27 January in preparation for the surgery.